The ultimate trading experience for institutional clients ADSS leads the market in providing sophisticated, OTC products that deliver a wide range of trading options. We offer services to more than 400 institutional clients globally around the world including retail brokers, banks, hedge funds and asset managers. We use bank, non-bank and multiple regional liquidity pools to deliver a unique trading experience. Using our proprietary OREX technology and MT4 trading platforms, we can match you with one of multiple sources of regional liquidity to optimise your strategies. For example, we can offer pure buy-side liquidity to certain clients. First launched in Abu Dhabi, ADSS has expanded rapidly and has offices in Hong Kong and London. Our position in the UAE capital allows us to bridge the liquidity gap between the closing of markets in Asia and opening time in Europe. To find out what we can offer you and your organisation, contact us or submit the Request a Callback form. CFDs including indices, commodities, treasuries and over 1,000 single stocks. ADSS sits at the hub of a global network of partners and delivers more than 30 sources of liquidity around the world, meaning you can optimise the value of your trades. Our platform offers low latency and high levels of flexibility. We partner with the world’s leading providers of low latency infrastructure hubs to guarantee we meet high standards and offer a quality service for traders around the world. We work with LD4 in London, TY3 in Tokyo and NY4 in New York. Liquidity: We provide bespoke liquidity solutions through our extensive selection of market leading Tier1, Tier 2 bank and non-bank market makers. Clients have access to a deep multi-layer liquidity pool. White labelling: Brokers can repackage services under your own brand name. This provides all the tools you need to monitor client trading and extensive back-office support. Margin solutions: A highly sophisticated technological platform that helps traders manage risk and make efficient use of capital by means of leverage. We can also provide clients with a Net Open Position (NOP) line for trading on a case-by-case basis. You can trade using two of the most sophisticated platforms on the market with ADSS. 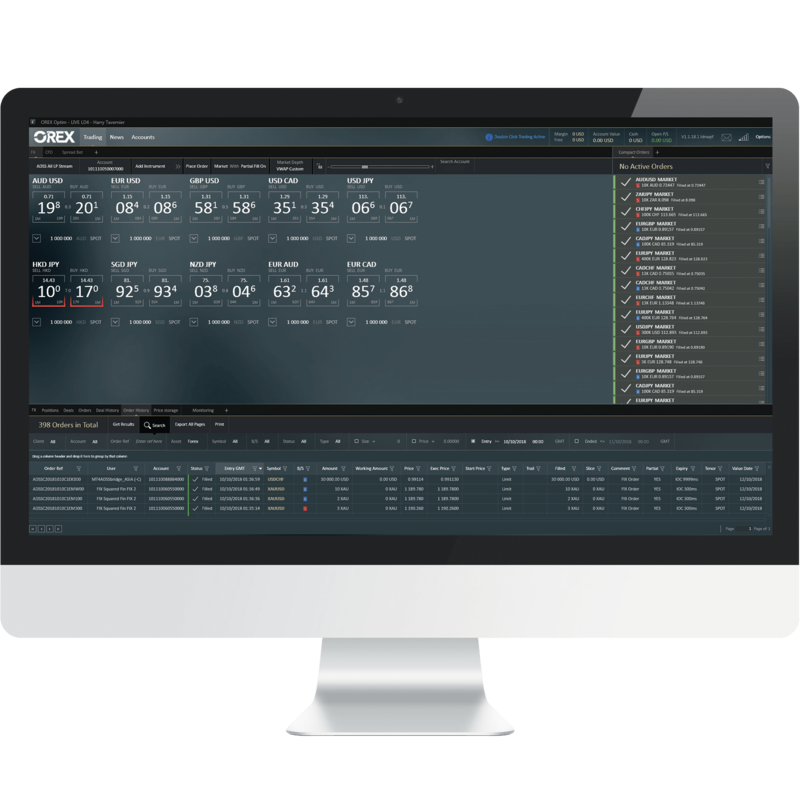 As well as our award-winning OREX platform, you can download MetaTrader 4. Each combines advanced features to deliver an innovative and powerful trading experience along with comprehensive support and education. Our award-winning proprietary trading platform allows you to trade what you want, where you want. With the OREX mobile app, you can check the status of your trades and make new ones from any Android or iOS mobile device. It offers the full power of the OREX desktop platform, as opposed to a scaled down version. The trading screen gives you all the information you need in real-time and you just have to tap, swipe, zoom or pinch to place a trade. Working with MetaQuotes, our MT4 solution combines one of the world’s most recognised trading platforms with the liquidity, pricing and support of ADSS. The result is a powerful and flexible platform and an unbeatable trading experience. FIX API is an electronic protocol for the exchange of financial information. ADSS uses a selection of FIX API services across our platforms - the team brings their extensive experience working with Tier 1 banks to deliver a system that matches your individual needs. With FIX API, we provide full-feature low latency FIX API for pricing and trading together with 24/5 support from our team of experts.